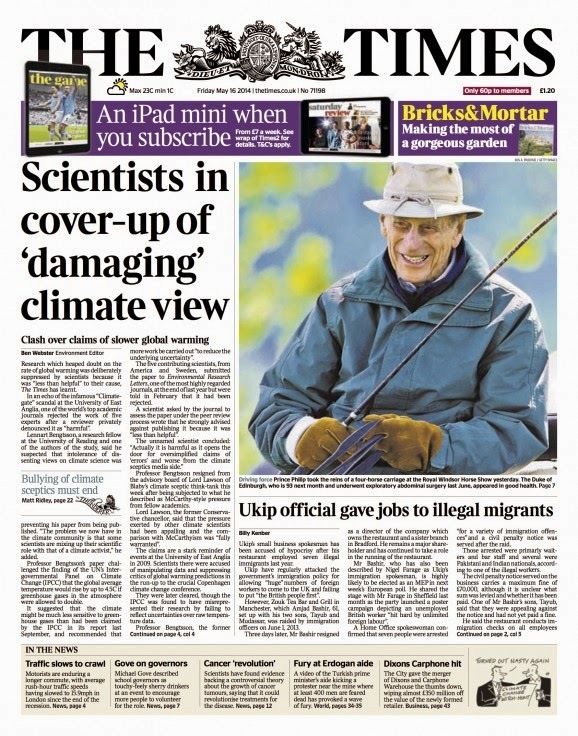 The Times reports that the Global Warming Nazis (GWN) are at it again. In the spirit of Climategate, the GWN are suppressing data that doesn't conform to their warped view of AGW. Professor Bengtsson’s paper challenged the finding of the UN’s Inter-governmental Panel on Climate Change (IPCC) that the global average temperature would rise by up to 4.5C if greenhouse gases in the atmosphere were allowed to double. It suggested that the climate might be much less sensitive to greenhouse gases than had been claimed by the IPCC in its report last September, and recommended that more work be carried out “to reduce the underlying uncertainty”. Should scientists wish to "reduce" uncertainty or should they suppress papers that did not help their cause? Should a true scientist HAVE a cause? A scientist asked by the journal to assess the paper under the peer review process wrote that he strongly advised against publishing it because it was “less than helpful”. I deeply regret that any scientist, particularly such a distinguished scientist as Bengsston, has had to put up with these attacks. This past week, we have seen numerous important and enlightening statements made by Bengtsson about the state of climate science and policy, and science and society is richer for this. We have also seen a disgraceful display of Climate McCarthyism by climate scientists, which has the potential to do as much harm to climate science as did the Climategate emails. And we have seen the GWPF handle this situation with maturity and dignity.